Taking over our Instagram account for the next two weeks is the persevering Apex Farmers Market. Apex, North Carolina was named for being the highest point on the railway line that used to carry produce to the markets and warehouses of Durham. The Apex Farmers Market, nestled in the heart of the city’s downtown, has flourished after rebounding from some unforeseen lows and is on track to reach its highest point. Started in 2010, the market vendor count was 12-15, and mid-season of 2014, the market manager left with all but 5 vendors remaining. The faithful five swore to resurrect the market in 2015 by founding a new organization, electing a fresh board, and charting a different course. The market board knew what local farmers and producers they wanted to solicit because they were steered by what kind of products they would want in their own homes and on their own plates. Seeking out excellent quality and great taste led to 25 vendors, which became 30 vendors, with room for 35 and a wait-list for hopeful vendors. Apex was transformed because of the dedicated members it had at its helm, people that understood the importance of reinvention, vendor satisfaction, and getting the word out. Honestly, feeling very inspired by the power and vision of people after interviewing with DeAlva Carraway, Apex’s Treasurer. We’re proud to hand over our Instagram to Apex Farmers Market, a local food destination and hub in the making! DeAlva Carraway: We are an outdoor market that operates each Saturday from April-October. Opening day 2016 was April 23rd. 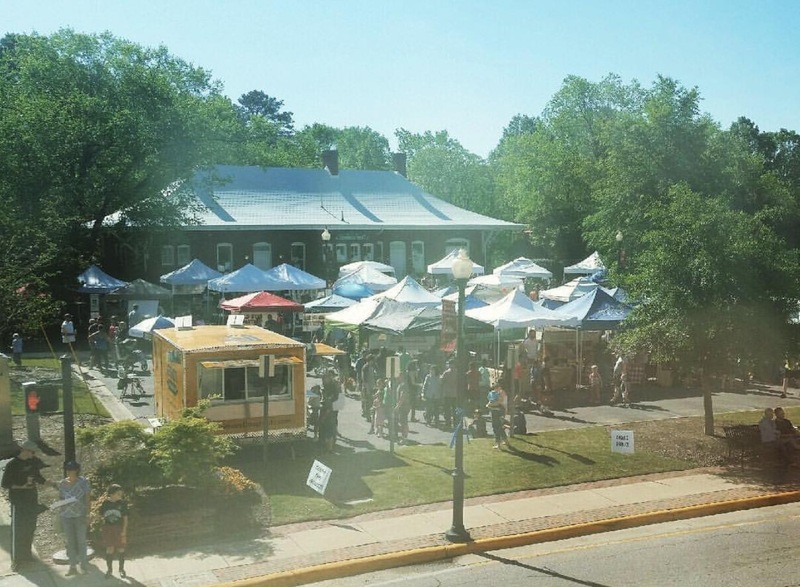 We are right in the middle of historic Downtown Apex–voted the #1 city in America to live in August of 2015! We were even featured in the Money Magazine video showcasing the town as #1. We are now a successful, vibrant, hometown market that prides itself on organic and sustainably raised produce, meats, eggs, and cheeses. We are full with 25-30 vendors each week and we have a waiting list of vendors waiting for a slot to open up. We have locally roasted coffee, locally made crafts, soaps, dog treats, breads and more! We are historically a farming community, and above all, we are an educational market–we educate people about the importance of shopping local, and the health and economic impact that simple action has on their lives and in their community. Our farmers and producers educate customers about their products and how they are made or raised EVERY week, and very much enjoy talking with market patrons about how their product is produced. We also do demos (cooking, soap making, growing, etc) and encourage customers to talk to our Farmers because K(no)w Farmers=K(no)w Food! DC: We have a SNAP program, we screened the What’s On Your Plate movie in the community and sent invitations through area public schools, we are hosting book club “Menu for the Future” both in small groups and as a Facebook group, local chefs do cooking demos and sampling with items made exclusively from our market to show people how to use in-season produce and we make sure we have ingredients available each week for a full meals: meats/protein, produce, breads, spreads and even dessert! We also host local musicians to provide live music, work with local organizations like Kiwanis to provide the blueberries and venue for their annual Blueberry pancake breakfast. We have a weekly food truck and we do 6 Special Event Markets each season: Christmas in July, Dog Days, Blueberry Fest, Harvest Festival with community participation contests Blueberry Recipe Contest, Pumpkin Carving Contest, Market Family Scavenger Hunt to encourage downtown business participation. We also have a weekly Kid Zone where kids can make a craft or plant seeds, etc. to take home. FMC: What have been some popular kids’ activities? DC: By far the most fun and well received kids activity at the AFM is our Find Sassy bit of fun! Sassy Chicken loves to hang out at the market and, each Market Day, she hides in a different vendor booth. Kids and parents alike enjoy scouring the market on Saturday in search of her. The first person to find her gets $5 in market bucks to spend at the market which has made for some happy kids. The vendors and parents love this activity because it encourages people to visit the entire market, stay a while and interact with farmers, producers, and handcrafters. Sassy Chicken has started many conversations that may not have otherwise happened, and has provided opportunities for our farmers to educate Market patrons about how the food they see at the AFM gets raised and brought to market. Sassy Chicken has been so popular, in fact that, mid-season this year, she was joined by her cousin Sanford to up the fun factor. We now give away $10 total in Market Bucks and post winning kid photos to our Instagram and Facebook accounts. In addition to the excitement generated by Sassy C, the AFM has enjoyed some close relationships with area businesses and sponsors who love to come to our market and make sure our Kids Tent has fun, take home activities! By far the most popular activities have been seed planting of all types and pumpkin painting. DC: We make use of as much Social Media as possible! Our Instagram account is fairly new but we have 2300 Facebook followers and an active community that comments and shares often. Our website sees a lot of traffic as well and we send out a weekly newsletter to almost 1000 people and have an open rate of 49% and a click through rate of 35%. We were also able to secure an overhead banner placement in the downtown area and our market is downtown so this was very visible and helpful to let people know we are there. We also put up several signs each market day to advertise WHAT we have: Chicken, Eggs, Baked Goods, Bread, etc. We are running a Race to Market 5K on opening day this year to open more channels of communication to our community. This is the most important thing to building a market in our experience: get communication out through as many outlets as possible and the communication should be regular! Also we tailor market activities to our community. We have a lot of young families and a wide range of incomes so we make sure we are family friendly and have a range of prices and accept SNAP for the low income families that are within walking distance. FMC: How does the market fit and find its place within the town? DC: As mentioned earlier, we serve the #1 Place to Live in America and we feel that we are an important part of our town’s appeal! We provide a real look at the history of our farming community. Apex wouldn’t be here without the farmers in our history (Mr. Jenks with Po Hous Farm has been with us for several years and more than one road in the town is named after his family farm) and we enjoy sharing this history with the members of our community, both new and old. DC: When we started we were vendor challenged! We had a horrible reputation due to prior mismanagement and vendors weren’t interested in applying. Furthermore, the downtown businesses nearby disliked us and many resented our presence so we worked very hard to improve these bad impressions and build relationships with nearby businesses and vendors. Now we are seen as a big asset to downtown businesses and the community. We attract people early in the morning and they stay (and spend) all day! We literally had to visit with each and every business and show them that we were partners in the success of downtown businesses rather than a hindrance to them. We had to attract desirable vendors and support them with our marketing and communication efforts. Now that we have community support and participation, we count this as our biggest success! We know we are an important part of downtown life and community life and our patrons and vendors alike benefit from these relationships. FMC: How did the newly elected board approach vendors and gain their loyalty? DC: We cast a wide net to draw new vendors into our market and, to support our vendors, we kept their cost very low (right around $110 for a full time vendor for the entire 6 month season). As in many places, we are market dense in our area so, starting from scratch (pardon the bad chicken pun), was not easy. We wanted local farmers with a concentration on sustainable practices and organic producers and we knew that our families-with-young-children community was focused on finding the best wholesome, local foods for their growing families. Luckily Apex, NC has a long history as a farming community reaching back to well before the turn of the last century, and there is a resurgence of small family farms in the area. We communicate regularly with our vendors and invite them to share any and all concerns and successes over the course of the season, and some of our board members are current vendors so we keep our fingers on the pulse of the market to stay responsive throughout the season. We send out surveys to gauge vendor wants and needs and we are not afraid to implement! Past that, we keep our online and social media presence strong so we are very much supporting each of the vendors marketing efforts as well as making sure our community knows we are there and that we are vibrant, committed, and growing! FMC: How long did it take to assemble the newly envisioned market? DC: We began working on assembling the “new” market while the old market was falling away mid-season in 2014. There was a board formed that held many meetings over the winter from 2014 and into 2015 when we went from “Can we do this?” to “We CAN DO this!”. Val Creager, a vendor, became our Volunteer Market Manager and Board Chair and guided us through paperwork, marketing, and day-to-day market operations when the 2015 season started. We were many times blessed with fabulous board members with just the right blend of passion and experience at the exact right time and finished 2015 strongly. With the start of the 2016 season, we were off the ground with tons of experience under our belts, and we worked hard to pursue enough money to pay a part-time manager. It’s tempting to say that we did it in a year and a half but that would be incorrect because we are still assembling! We do have the basics down and now we must pursue longevity as well as success. As was mentioned before, our area is market dense so we do find ourselves in “competition” with other area markets and do have several vendors that participate at multiple markets. We even have vendors that we lost to other markets so we know we have to work harder to attract and retain great quality vendors each year. Our goal is to make our vendors profitable and our community happy with all the services we provide: education, great foods, locally made products, fun atmosphere, so we can continue to be an exciting and vibrant addition to our community. FMC: What, besides gathering new vendors, was challenging about the process? DC: Getting the word out! We determined that we didn’t EVER want to hear the words “I didn’t even know Apex HAD a Farmers Market”! We were already on FB and had a weekly newsletter with around 400 recipients to support our main website from the old AFM so we had to build on that. Currently, our newsletter reaches 1400 people each week and we started our Instagram account (100 followers) just prior to the 2016 season to reach even more people. Farmers markets are tailor made for Instagram with all the activities, vibrant colors, beautiful produce and fun. Added to that, all the fun we have with Sassy Chicken. We determined to have fun on this visual platform so we “hatched” Sassy as our Instagram queen so people could follow her from around town to local farms to get to know the area and our market specifically. Additionally, it has been challenging to let the community know that we are a VOLUNTEER RUN market. There is the misconception, that we’ve worked hard to dispel, that the town funds us when, in reality, we rely on hard-working and dedicated volunteers, sponsorship partners, and donations to keep us alive while we are growing. We won some small grants this year and were able to pay a market manager part time to help run the market. We also gained our 501c3 non-profit status through fiscal sponsorship with the Abundance Foundation NC so donations are now tax deductible. We are pursuing our own 501c3 status as well but know that we must continue to chase grant and sponsorship money to help with operating costs while we continue to grow. FMC: What advice would you give a market in a similar situation? DC: Work harder and spend more time that you ever thought possible! It was a labor of love for us and we were blessed with board and community members that wanted to help but it was a LOT of hard work and dedication and carving out time that we didn’t think we had to make it happen! Also, immerse yourself in Social Media and use it to promote your market, your community, your farmers, your handcrafters, and, ultimately, small businesses everywhere but don’t lose sight of the people that you’re serving. FMC: Why do you love being involved with the market? DC: Individually, I love going to a place each week where people care passionately about their food and their community. I love the colors, sights, and sounds of Market Day and I love being on the board of an organization with a great group of people, mostly women, who are passionate about shopping locally and supporting the small businesses in their community. I’m inspired by farmers and producers that enjoy taking time to educate everyone about food choices and growing, making, or raising food responsibly. They work hard all week and still come to the AFM filled with enthusiasm about their product and that is contagious in a good way.